Last weekend, Saturday Night Live returned with its first episode of 2016, hosted by none other than Star Wars: The Force Awakens star Adam Driver. As expected, the actor reprised his Kylo Ren character on the show, but in a way most didn't expect. The series aired a pre-taped sketch with this villainous character appearing on a fake episode of the CBS reality series Undercover Boss, set on the Starkiller Base. Earlier today, Saturday Night Live release a new video featuring outtakes from this hilarious sketch. 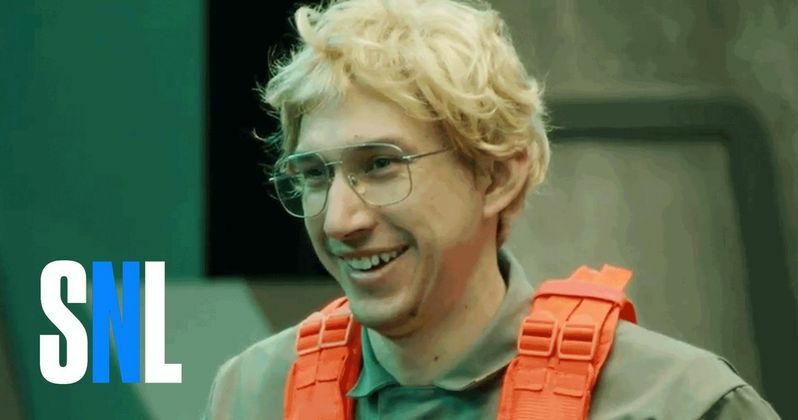 This sketch was set on the powerful Starkiller Base, where this villain went under cover as a radar technician named Matt, where he conversed with some of his underlings, played by Taran Killam, Bobby Moynihan and Leslie Jones. As you can see in these outtakes, Adam Driver had a tough time keeping his giggle fits under control. We also get a few memorable moments from Leslie Jones, who is seen trying to mess with one of the stoic Stormtroopers. Star Wars: The Force Awakens has been shattering box office records left and right, earning over $863 million at the domestic box office and $1.8 billion worldwide. It currently has the record for the highest-grossing film ever domestically, and third largest movie ever worldwide, behind Titanic ($2.1 billion) and Avatar ($2.7 billion). It remains to be seen if Star Wars: The Force Awakens can break these records, but this blockbuster still has plenty of time before it leaves theaters. While no cast members have been officially confirmed for Star Wars: Episode VIII yet, Adam Driver's Kylo Ren is expected to return, along with Star Wars: The Force Awakens stars such as Mark Hamill (Luke Skywalker), Carrie Fisher (General Leia), Daisy Ridley (Rey), John Boyega (Finn) and Oscar Isaac (Poe Dameron). Production was recently pushed to February, so writer-director Rian Johnson can focus on rewriting the script. This episode of Saturday Night Live marked Adam Driver's hosting debut of the hit series, and with Star Wars: Episode VIII coming at the end of 2017, it's certainly possible he could return to host then. In addition to the outtakes, we also have the original sketch video below for you to watch again. What do you think about Adam Driver's new Saturday Night Live sketch and these hilarious outtakes?